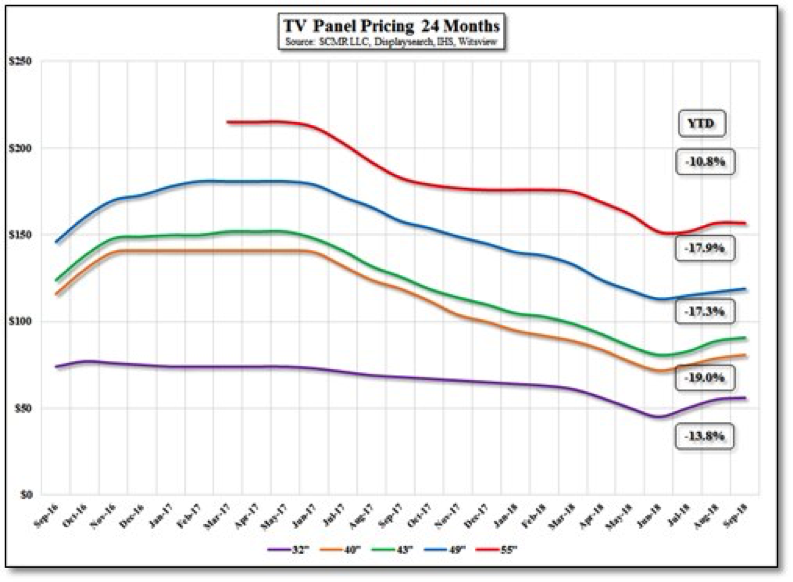 Large area panel prices rose in August with TV panels up 4.6%. September panel prices by category are shown in the table below, with TV and monitors up sequentially by 1.4% and 0.3%, respectively. TV displays, saw a moderation of large price increases since July, as TV set makers face a decision point. With moderate levels of inventory at the set level, they can accept higher prices or cut back orders and pull from inventory as they prepare for the holiday season. Panel producers will continue to try to push through increases but are starting to meet resistance from larger TV brands, and while expectations are for a strong holiday season in the North American market, another round of panel price increases will keep discounting to a minimum and cap holiday sales, which sets the tone for the remainder of the year. Panel makers are trying to push prices up to regain some of the margin lost during 2H ’17 and 1H ’18, and TV set makers trying to hold on to the better margins during the same period. We expect relatively flat TV panel pricing for the remainder of the year as buyers use inventory to leverage negotiations with panel makers. 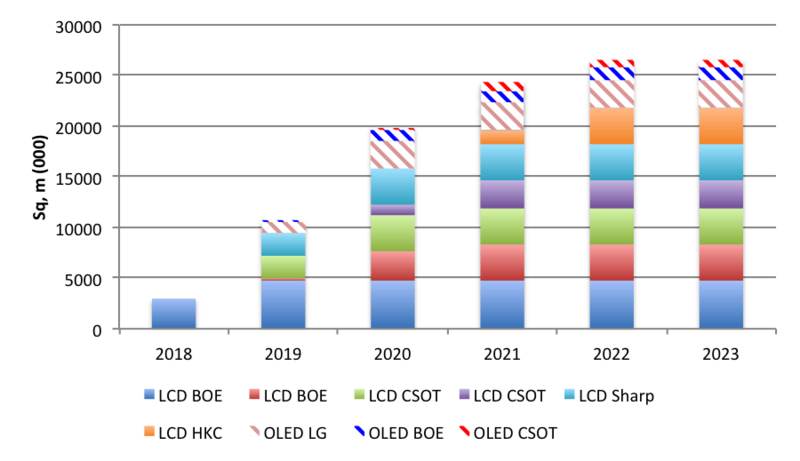 On a longer term basis, despite competition from OLEDs at the very high end and the closing of some inefficient older generation LCD lines, capacity continues to increase as the Chinese Gen 10.5 fabs reach MP increasing L/A capacity by 15% as shown below. The new capacity could put pressure on panel prices, with only new formats, such as borderless or ultra-large sizes generating significant premiums and ultra-large (65”+) panel capacity, a focus of Chinese panel producers, will also increase, particularly in 2019 and beyond.